Friday April 29th 1892 It was a splendid day. We washed some things and done some sweeping. I was working with the chickens a little after dinner. Ern Weldie called awhile I went over to Hatties to supper and did not come home till bed-time. Saturday April 30th 1892 Fanny came after Mother this morning. There was some rain before dinner but it rained nearly all afternoon. I knit a little what spare time I had during the day. The folks did not come home tonight. Sunday May 1st 1892 It rained the greater part of the day. I was busy all forenoon with the dinner and read in the afternoon. I was out where Will had to fix fence to keep the cattle in. Father & Mother came home. Monday May 2nd 1892 It was still cloudy this morning but we washed a few things. It took all forenoon with the usual work. I was down where Will was fixing fence in the afternoon. Mr Nicholas Father took supper here. I knit what time I could spare from other other work and wrote some. Tuesday May 3rd 1892 We ironed this morning and I helped all forenoon with the work as I done baking. It was still cloudy and rainy. There was a heavy rain last night. 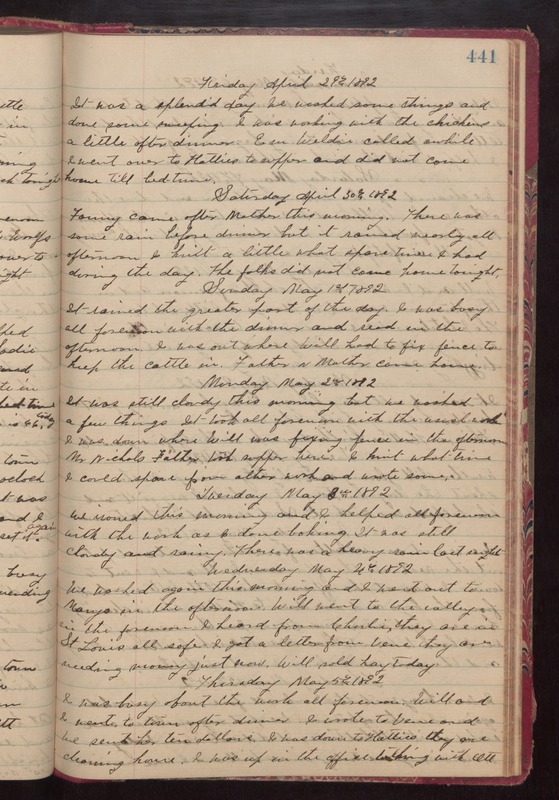 Wednesday May 4th 1892 We washed again this morning and I went out to Marys in the afternoon. Will went to the valley in the forenoon. I heard from Charlie. They are in St Louis all safe. I got a letter from Vene they are needing money just now. Will sold hay today. Thursday May 5th 1892 I was busy about the work all forenoon. Will and I went to town after dinner. I wrote to Vene and we sent her ten dollars. I was down to Hatties they are cleaning house. I was up in the office talking with Ott.